What is new this year, however, is the realization that we have arrived at a climate impasse. The US government hasn’t done anything meaningful to address the climate crisis, despite lofty rhetoric from Obama. On the contrary, the government has done, what it can, to foil the international efforts to address the crisis. Recently leaked documents by Edward Snowden reveal that the NSA had spied on the delegates of other countries during the 2009 UN Climate Conference COP15 in Copenhagen. Moreover, last year Chris Williams made an assertion that “it was, after all, he [Obama], who was the lead protagonist in wrecking the international climate talks in Copenhagen.” But why did the US wreck the Copenhagen climate talks? This will become clear a bit later. Additionally, the dismal failure of the subsequent UN climate negotiations has made abundantly clear that most nation states are not interested in solving the climate crisis, either. I’ll call this collective global inaction—climate impasse. The Indo–US Energy Dialogue points to something new for America. During the last half of the 20th century, the US acquired much of its oil from around the globe through petro imperialism, which has caused deaths and devastations in far away lands that most Americans know little to nothing about. Now the table is turning; petro imperialism is returning home to America. India is attempting to acquire oil from the US. On the American soil, this will cause much suffering. As the US inches towards becoming the largest oil producer in the world, like mushrooms in a temperate forest, drilling and fracking rigs will pop up all over, on land and in the oceans, from the Gulf of Mexico to the Arctic, from the western desert to the eastern forests, locking us into another one hundred years of fossil fuel digging in North America. The extremely uneven burden of this 21st century American petro imperialism will fall on the Native American, rural, and the underprivileged communities. 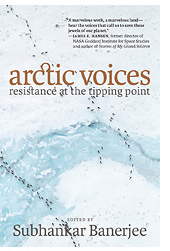 There is resistance in the US also, from the Arctic to the Cove Point.